Still from the 3D coronation film "A Royal Review"
In one of the more surreal moments of my life, I found myself queuing in the rain to pass security checks and get into a highly spruced up BFI Southbank, celebrating the 60th anniversary of the opening of the original BFI cinemateque, the National Film Theatre. The usually welcoming, casual, trendy Benugo Riverfront Cafe had been transformed into a staid British 5 star hotel lobby, complete with pianist, muzak and earl grey tea served in porcelain cups and accompanied by victoria sponge. The reason for this rather bizarre re-dressing of the film set? We were awaiting the arrival of Her Majesty Queen Elizabeth II. The audience was a mish-mash of BFI staff, governors and supporters, various people associated with film, and a few humble reviewers, including, bizarrely, me. Spotted in the queue - directors Richard Ayoade (SUBMARINE) and Tom Hooper (THE KING'S SPEECH), London Film Festival director Clare Stewart, reviewers Peter Bradshaw (The Guardian) and Jason Solomons, and random famous media types like Paul Gambaccini - the only one of the media types to wear a very handsomely cut pinstripe suit that wouldn't be out of place in the Square Mile. One ticket stub I won't be binning. 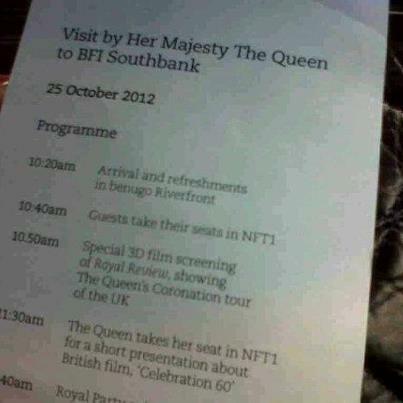 While "Her Maj" was touring the BFI's impressive new Reuben Library and the Mediateque, meeting local schoolchildren, the rest of us took our seats in NFT1 for the obligatory protocol notices (do NOT tweet in front of HM), and to watch a restored version of "A Royal Review" - an early example of a 3D movie showing the Queen's journey to and from her coronation in a golden carriage, the cheering crowds, and her tour of Scotland and the City thereafter. It was pretty banal stuff, with a portentous voiceover of the type spoofed by modern comedians, but also made me rather nostalgic for a time when the Monarchy was under no circumstances a subject of mirth. 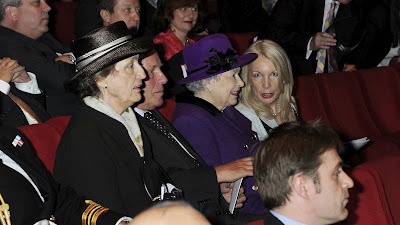 HM takes her seat in NFT 1 with Amanda Nevill on her left. And then, the moment we were all waiting for, the Queen herself, in a royal purple coat and hat, took her seat to watch Jonathan Ross introduce showreels highlighting the history of British cinema and the restoration work of the BFI. 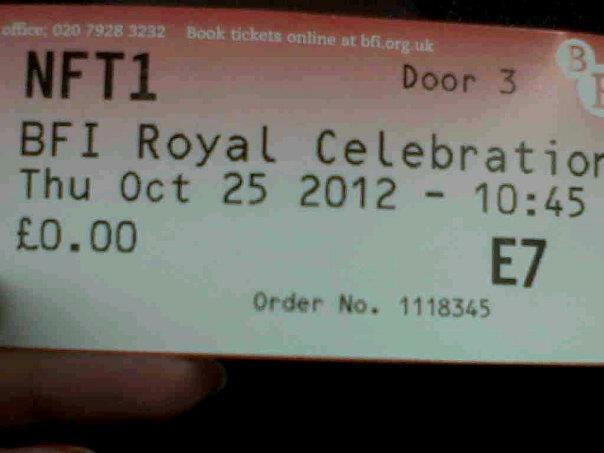 Most bizarre, we were treating to excerpts from the royal collection, which the BFI is now digitising. How did HM feel seeing her Great Grandmother, Queen Victoria perambulating in Balmoral with Tsar Nicholas II - the first film of monarchy shot in 1896. 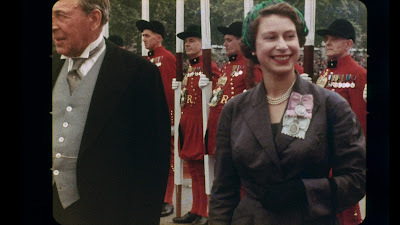 And how did she feel seeing her own mother and father in home cine-film, playing with her young son, Prince Charles? As the reels ended, we were all herded back into the Riverfront to watch HM move through the line-up, and Greg Dyke give a gushing speech, and present HM with a movie poster. One wonders what use she will have for it - she looked polite but faintly bored - one suspects cinema is not high upon her list of personal interests. And then, she left us, driving off in her beautiful Roller? Bentley? with the royal flag. And, relax. 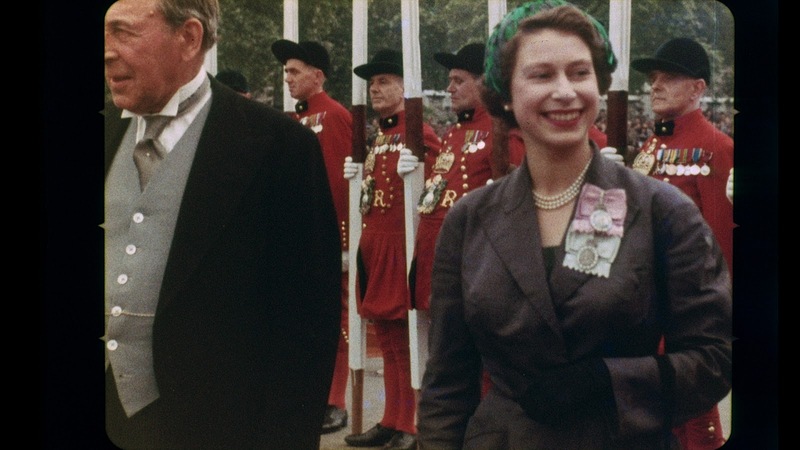 As Armando Ianucci put it so well in his British political satire, IN THE LOOP, most of us present had been "room meat", filling out the room as admiring subjects, but not actually called upon to interact with the monarch who glided before us, in one more event that must make up the seemingly endless parade of her life. 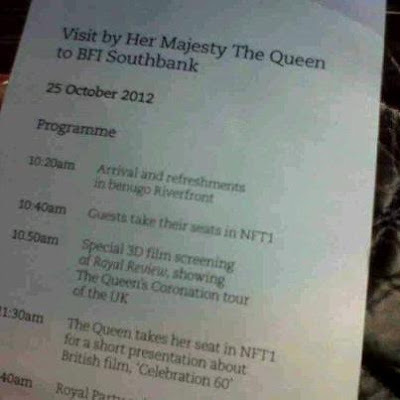 Still, I was highly grateful for having been chosen to attend. As modern and cynical and indifferent we might all affect to be, there is an undeniable feeling of pride, nostalgia and, yes, gratitude, that our Head of State is a woman who has taken her service and duty to the nation so very seriously indeed. God save the Queen.